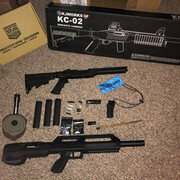 I have my brand new KJW KC-02 version 1 for sale with tons of accessories/upgrades. Everything is brand new and the gun has only been shot a few times. Bought this a few months ago and my wife needs a new camera so I am selling this to try to get some money. Tapp airsoft electric drum winding mag. I live near lansing, and frequently play at futureball in whitmore lake if you wanted to test or meet there. If you keep the gun in its current form, you must be careful not to leave it in a hot car, the stock and hop chamber are 3d printed and can deform. If you switch to original stock and chamber you will not have to worry, my plan was to have it in bullpup body in spring and fall then the original in summer. I also have an extra tank, regulator, and line that I would also be willing to sell if you need one.